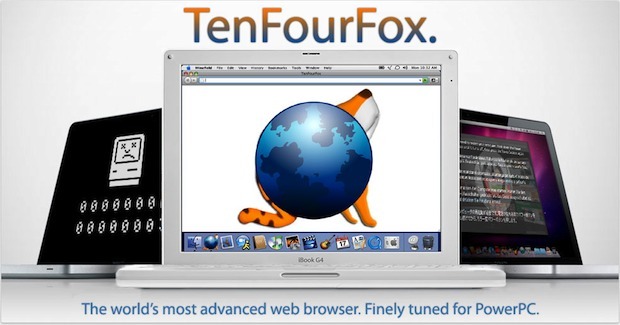 TenFourFox is an essential web browser for any Mac OS X user that is still using a PowerPC machine. It’s a fork of Mozilla that is practically identical to Firefox 4, the only difference is that it includes support for PowerPC chips, meaning you’ll get all the CSS3 and HTML5 support that Firefox 4 comes with, and perhaps more importantly, most Firefox add-ons are supported. …we were horrified when Mozilla delivered the one-two punch of dropping both support for Tiger and our beloved Power Macs from Firefox 4. A quad 2.5GHz G5 isn’t worth using to surf the web? Really? And you guys still support Windows XP? Sure sounds ridiculous when they put it like that, doesn’t it? You can download TenFourFox directly from the developers site, it’s completely free and has builds optimized for PowerPC G3, G4, and G5 architecture. System requirements to run TenFourFox are a PowerPC G3, Mac OS X 10.4.11 or Mac OS X 10.5.8, 100 MB of disk space, and 256MB of RAM. Performance is apparently really fast, although they do caution that video playback will be poor on PowerPC Macs that are slower than 1.2GHz. What are you waiting for? Breathe new life into that old Mac. Long live PowerPC! And in a year or two, someone will be writing TenSevenFox to get Firefox 6 to work on the abandoned Intel architecture after Apple moves to ARM… say it ain’t so! i’ve been using tenfourfox exclusively for about 6 months now on my soon to be extinct PPC mac pro box. love it. all the extensions and scripts i use all work flawlessly with it. i was using the builds in the link zedd posted prior to that…but tenfourfox has always seemed more stable for me. they also just recently implemented an update available notification too. much less of a headache than dealing with those beta builds and all that junk. not sure if im the only one thats gotten poor performance out of TenFourFox. been using it for several months and always updating it. but it lags so much that its almost unusable. i tried using a PPC build of Camino, and that runs great. its fast and pages render quickly. though of course it lacks extension support. I understand the author sent the finished JIT compiler back to the Firefox team (which solves 1 of their 2 given reasons why they can’t be bothered to support PPC) and they apparently don’t care since it was all just a bunch of BS excuses to save them some work. They’ll continue to support WinXP, though (from 2001 era). I put most of the blame on Apple, though. They didn’t have to remove PPC support from XCode (which effectively makes it a nightmare for newer software to easily include PPC support) and thus Apple shows its contempt for users of old machines, proving they only care about making more money trying to force you to upgrade your hardware even if it works fine for your needs. Apple has no soul anymore and Steve Jobs only cares about smart phones these days.